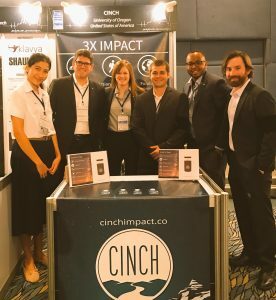 I am pleased to share news about a successful campaign by our students from the Oregon MBA and Oregon Law School at the Global Venture Labs Investment Competition (formerly MOOT Corp) this past weekend at the University of Texas at Austin. 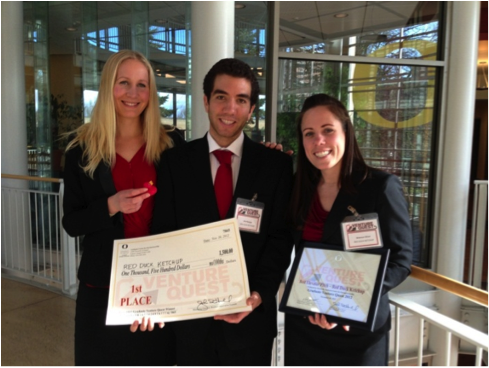 For the first time ever the University of Oregon placed 2 teams in the semifinal round. To put that in perspective, there were 33 teams that started the competition on Thursday, with 10 advancing to the semis. 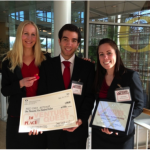 That’s 20% of the top 30% representing the UO – not bad! This is the best showing for our program at this competition in many years. I couldn’t be more proud of their efforts. 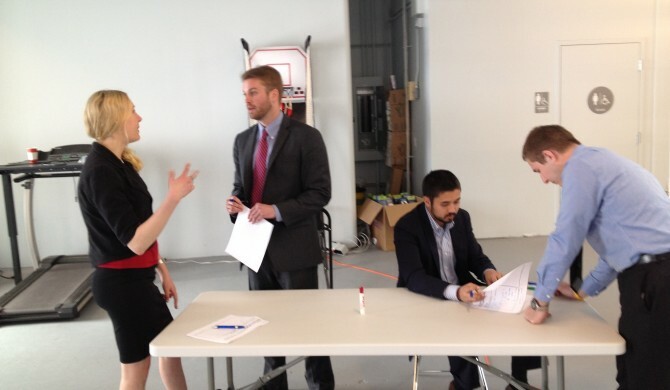 Airfit – Second year MBAs Cynthia Sandall and Ty Manegold have brought a concept to life. The idea, fitness facilities in airports behind TSA, is simple. The execution of the concept and the actual market launch of the concept is quite complicated. 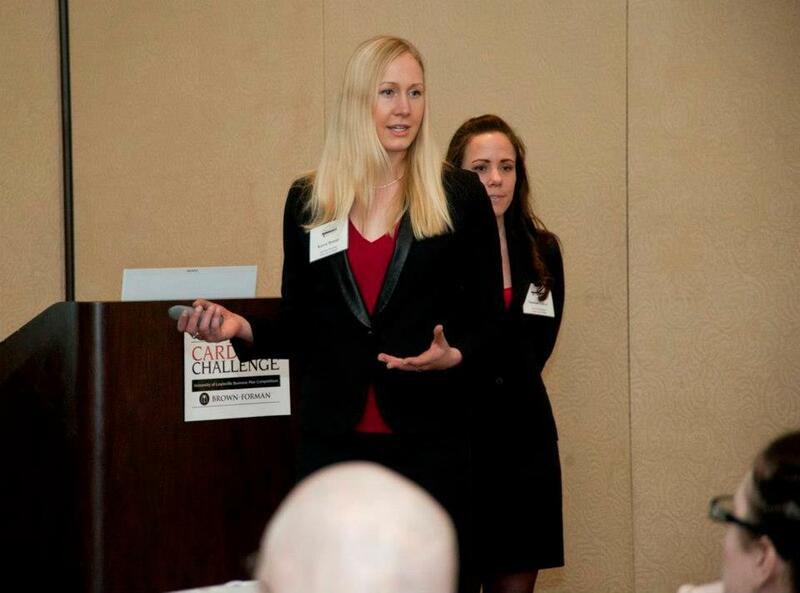 I applaud their tenacity of research and the way they’ve leveraged every possible LCB class project to gather amazing customer research and build a great plan. 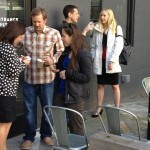 You will see the first location in SFO within a year and JFK shortly thereafter. They’ve made this real and are launching. Bravo! 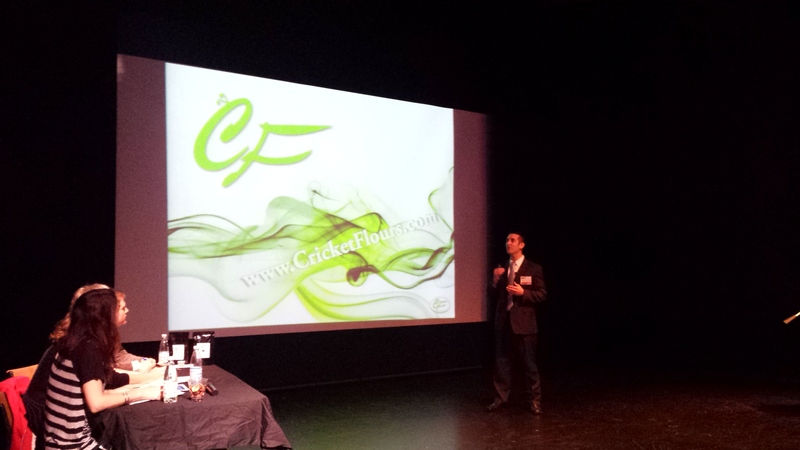 Cricket Flours – Charles Wilson (2015 JD) and Omar Ellis (2015 MBA), with help early on from Paul Butler (JD/MBA) successfully pitched their cricket based protein powder business to the judges in a way that focused on their deep understanding of customers, the business model, and their markets while far overcoming anyone’s “You want me to eat what?” objections. Their best customer validation? How about a half dozen or so orders from judges and other competitors over the past 2 days? 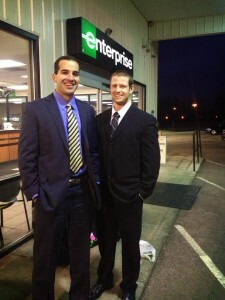 They have a rapidly growing business that will be a great success story. 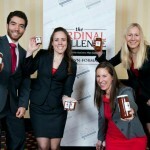 I thank the many staff and faculty members who have helped our teams develop into poised and confident entrepreneurs. Specifically, I want to thank Allan Cochrane, my co-instructor for MGMT 625 and the Venture Startup courses. Al has logged many miles and hours helping prepare ‘investor ready’ teams. Additional thanks goes to Michael Crooke and John Hull who have given these teams countless tips and spent a good deal of time coaching them individually and as teams. I should also recognize the contributions of Randy Swangard, who was in attendance as the head of the GVLIC rules committee and without whom the program to do all of this wouldn’t exist. Every faculty member who has taught any class to these fine students should give themselves a pat on the back, as the overall education of our students is outstanding and it shows when we’re up against some of the brightest minds in the world and come out successful. 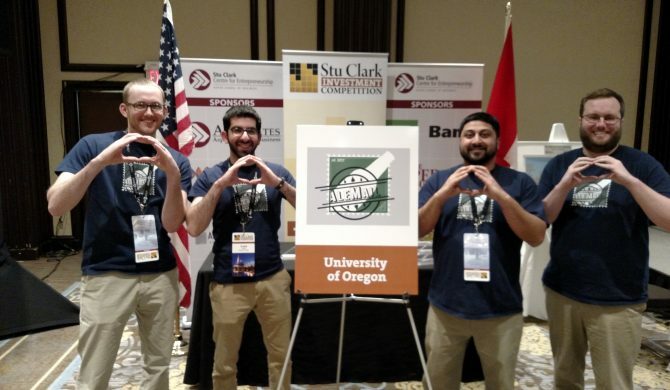 Although their journey ended in the semi-finals (the competition is tough and only 4 of 10 teams advanced) I am 100% confident that we’ll soon have two more inspiring stories of Oregon MBA led student startups. Success at these competitions shows the depth of research they’ve done and their commitment to making their ideas real. At the end of the day, that’s why we (faculty and staff) do what we do – to inspire students to be the best they can be and reach higher than they might think they can. That is Winning the Day, that is what we do. The first Saturday in May was a busy day! Not only was it the Kentucky Derby but it was also the Spring Scrimmage game for our football team (Oregon won). 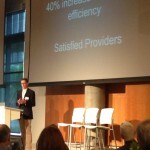 However, the most important event was the second annual Pitch Stream hosted by the Fertilab Thinkubator, a local resource network for the Eugene entrepreneurial community. 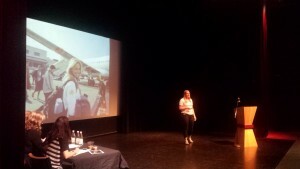 Pitch Stream was held at the Wildish Theater in Springfield and awarded over $5000 in cash and prizes for the winners. 16 companies were selected to present a 7 minute pitch (3 minutes for Q & A) about the awesomeness of their value propositions. Kimmy Gustafson, last year’s winner, Fertilab community manager, and start up CEO, kept the event running smoothly and on time. Not a small task for entrepreneurs. Kimmy and her husband Nathan (both UO alms) started Manage My Co-Op, a software platform to ease the coordination of orders for buying clubs. 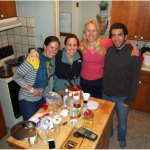 We were lucky enough to have our two MBA Venture Track teams complete: Cricket Flours and AirFit. I am not sure if it was the luck of the draw or a deliberate arrangement, but Charles B. Wilson started the contest off with a fantastic presentation promoting the health benefits of adding milled crickets to your diet and Cynthia Sandall ended the competition by introducing gyms in airports post security to increase your healthy options during layovers. 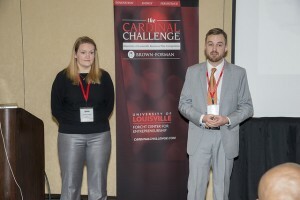 Capitalizing on primacy and recency effects, Cynthia took home the People’s Choice award and Charles Wilson took home the grand prize of $2500 in cash. 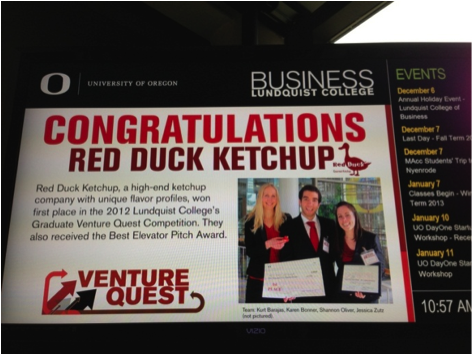 Way to represent Oregon Entrepreneurship, teams!! The Entrepreneurship Center at the University of Oregon produces companies in all shapes and sizes. With help from the community, I know these teams will make it far! What is up next for these amazing ventures is the University of Texas at Austin Global Venture Labs Investment Competition held May 7-9, 2015. 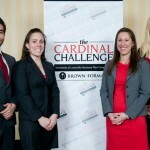 Cricket Flours and AirFit will go up against the best graduate venture teams in the country. However, the academic framework, extensive faculty support of Nathan Lillegard and Al Cochrane, and individual drive will no doubt give our teams a fighting chance. If you are in Austin, swing on by the competition and introduce yourself. 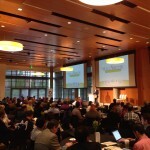 Who knows, you may be the next great Oregon Entrepreneur! 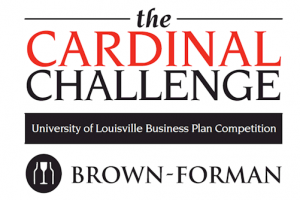 After leaving Eugene on a 5:28 am flight, we arrived in Louisville, Kentucky, ready to pitch our company, AirFit, to the judges and audience at the Cardinal Challenge Business Plan Competition. 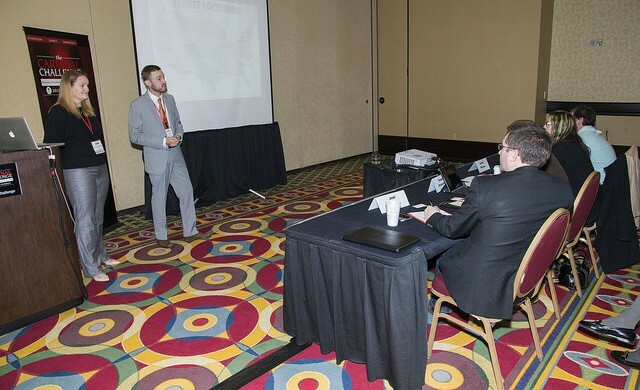 We knew we were up for a challenge as most teams competing were involved in life-sciences, and the judges would have to completely shift their mindset for our presentation. Unlike our fellow teams with their latest-and-greatest diabetes monitor or a new surgical instrument, our product is simple to understand. AirFit is revamping the dreaded layover experience by placing gym and shower facilities into airport terminals, located behind security. While most teams spent a significant amount of the presentation explaining how their product was better than the alternatives, our feat was to explain all the financial costs associated with our endeavor and why we were the best team to bring this vision to reality. Friday evening began with a social reception and introduction. During our candid and brief self-intro to all the other groups and advisors, AirFit was immediately well-received, garnering applause and supportive cheers upon the initial announcement of what we were trying to accomplish. 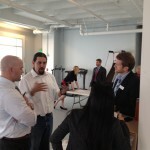 Clearly AirFit’s value proposition was meeting the needs of many people in the crowd. Funneling this supportive energy, we took to the stage bright and early the next morning, unveiling AirFit to the world outside Oregon for its maiden flight. 15 minutes of uninterrupted presentation, followed by another 15 of Q&A, we delivered a solid performance. The only team at the competition with just two founders, a completely different business model than any other company present, and having nothing to do with the deep fried chicken style concepts normally seen at this Kentucky competition, AirFit had the cards stacked against us. These uphill battles became apparent when we discovered we unfortunately did not make it onto the final round. Major challenges revolved around convincing judges to remain objective and not ask whether they, in fact, would use the product, but what the voice of the customer at large was telling us. According to our market research (tinyurl.com/AirFitSurvey) of over 200 respondents, polled mainly in airport or gym environments, more than 85% indicated an interest for AirFit’s services, and at even what price-point they would be willing to pay. Unfortunately these key data points fell on deaf ears and are an area of improvement in the presentation we plan on addressing in our next competition this spring. While disappointed we did not win the competition, all of AirFit’s founders and team enjoyed the experience for what it was – a tremendous learning opportunity and one of the many rite-of-passages most new ventures must undergo. 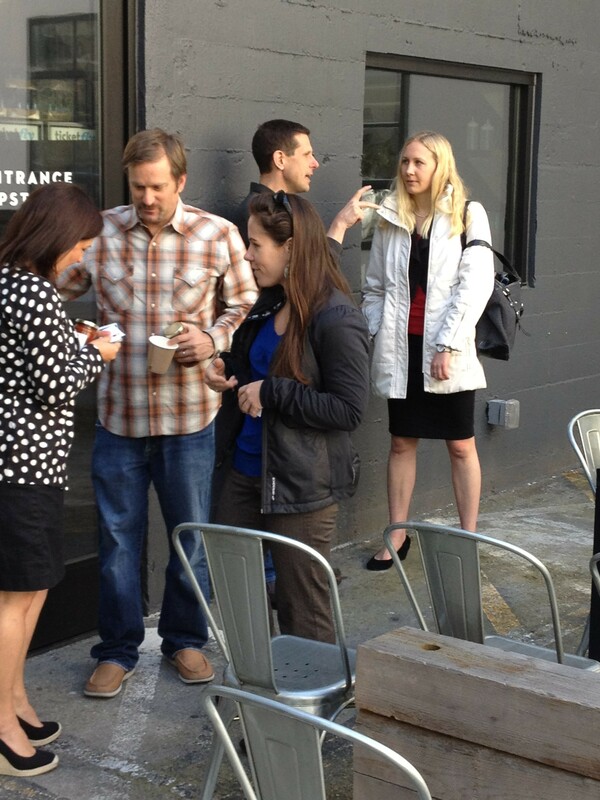 Our concept had open validation among individuals in the crowd, and even from competing teams. The ability to compete in such an environment is a fantastic opportunity in and of itself. Each team present in Louisville clearly contributed their own blood, sweat, and tears over the last few months to get to this point, only raising the overall caliber of the entire performance. The final outcome of the situation is that all AirFit members are ready to tackle the next presentation, next investor meeting, and next step involved in taking our company forward on the path to success. Namely, we are looking for one more individual with prior gym management experience to join the team in an operations role, and the next few months before graduation will be dedicated to this task. Oregonians are generally averse to self-promotion. We’re a humble lot (mostly) that figure it’s better to let our achievements speak for themselves than spend time and energy seeking recognition. It’s something we do and part of the culture. But I’m going to step out of that mold for now and praise some of our students and community friends after witnessing the Willamette Angel Conference today. First, I want to thank everyone who has helped bring the Matthew Knight Arena and Ford Alumni Center together. The WAC was hosted in the Guistina Ballroom at the Ford Alumni Center this year. Finally, the UO has a world-class facility to have formal events! Don’t get me wrong, the old EMU Ballroom and a couple of other facilities on campus are great. However, the modern and uniquely Oregon design of the FAC really stands out for people coming into town. Having Matt Arena right next door gives the East campus area a center of gravity that the whole university needed. 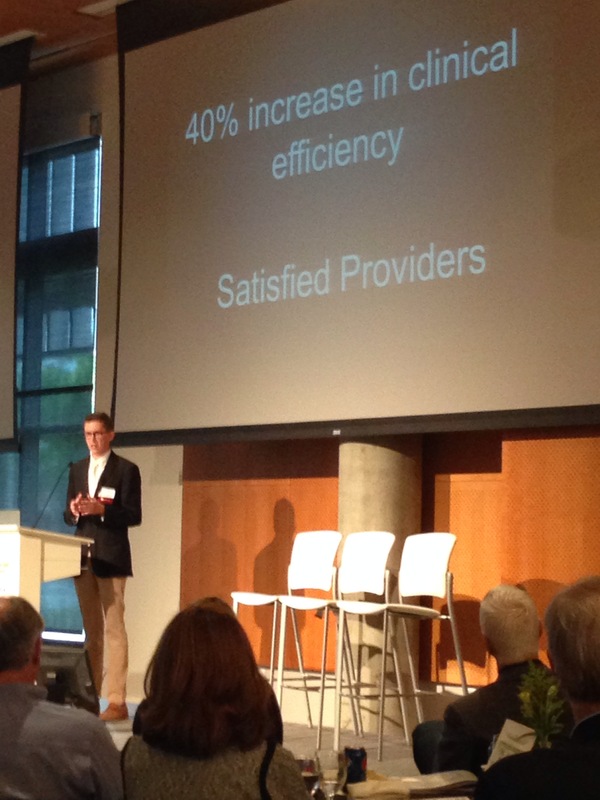 The Concept Stage winner was Orchid Health – A local Eugene company creating direct primary care clinics in medically under-served communities. Started by a one-year-ago grad and a soon-to-be graduate. 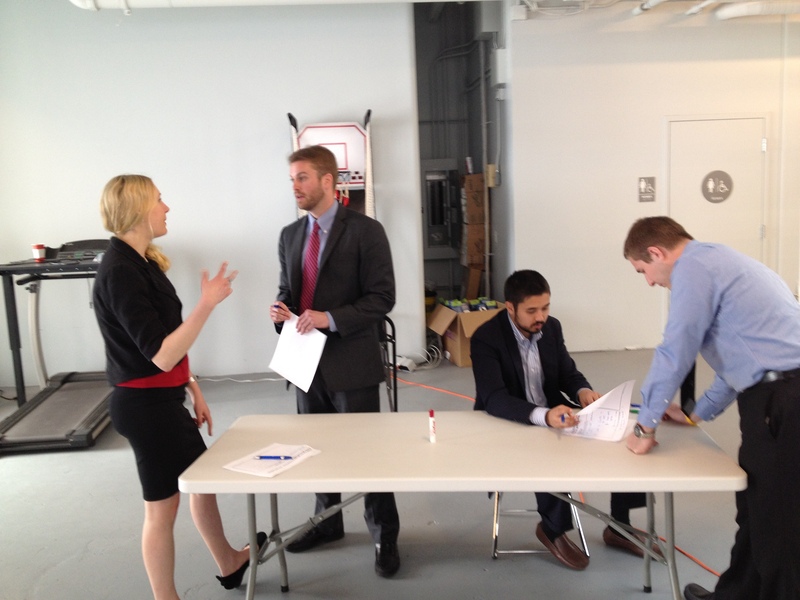 That’s right, early twenty-somethings starting a health care company. Cool. Blue Dog Mead, a well-established beverage company, was represented at the event by CEO and co-founder Simon Blatz. Keeping the dream alive and mead flowing. The Oregon MBA and other Lundquist College of Business students helped with the due diligence process and as volunteers for the event. Dune Sciences, one of the five finalist companies has strong ties to the UO. The company was founded by John Miller and Jim Hutchison based on research from their lab in the Materials Science Institute at the University of Oregon. I know that this team has been working at this for a long time to bring their technology to market. Making it to the WAC Finals was a big accomplishment for them. I know that Dune Sciences is going to continue to grow and be a big UO and Eugene success story. Finally, let’s talk about RAIN. 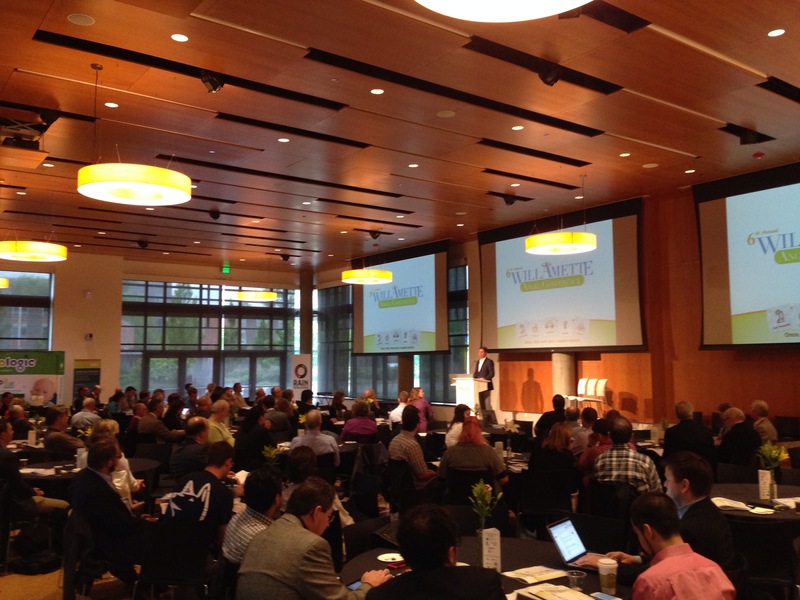 The Regional Accelerator and Innovation Network is finally up and running in Eugene. Joe Maruschak, a UO art major and game development entrepreneur, is taking the reins of the local node of this program. Joe is a community builder who understands the role an accelerator and incubator can play in developing an ecosystem for startups. Good things are on the horizon. The support that the Office for Research Innovation and Graduate Education has provided getting RAIN going has been invaluable. Associate Vice President for Research & Innovation Patrick Jones has brought his experiences building a similar community in Tucson, Arizona, and at the U. of Arizona to bear to help make this a reality. Without this kind of fundamental support in place, building a thriving entrepreneurial community is harder. With this high-level support, we’re all pulling together to improve the community and build a place where students can stay after they graduate. So be on the lookout for more great things happening here in Eugene. You may need to ask to hear about it. We’ll be busy letting our successes speak for themselves. Our trip to the Bay Area last week was action packed, to say the least. After a long drive from Eugene to San Francisco, we had an evening to rest up before our first day of business visits. FSAC split from the main group to conduct their own visits (look for another post soon! 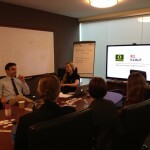 ), LCE and CSBP hit the ground running with the executives from Ticketfly. CFO Bob Komin is a relatively new addition to the Ticketfly team, but as a UO undergrad alum, he was more than happy to share his experience with our group, and give us advice on how to maximize the power of our MBA. Klout was second on our agenda, and provided us with a fantastic visit that helped us understand what it’s like to be part of the San Francisco startup scene. 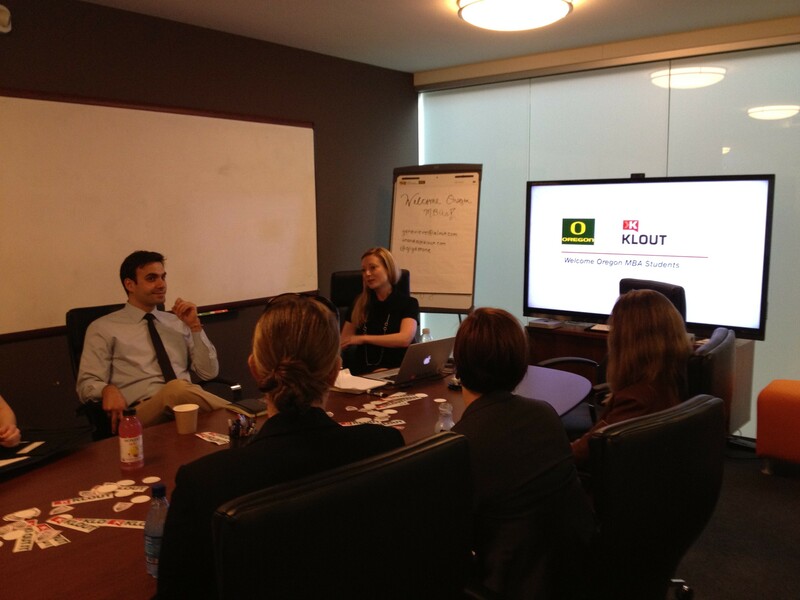 Students enjoyed learning about Klout’s mission of “empowering every person by unlocking their influence.” During our visit, we also learned about the company’s formation, and its goals for the near future. Students also learned about the importance of social media in today’s society and the influence each Facebook and Twitter user can generate through sharing content. The reward-based gamification of social media via Klout was also very interesting, as it provides incentive for individuals to target their online interactions in order to achieve personal gain. The next startup on our schedule was Dropcam. At Dropcam, we observed a great example of “recognizing business opportunities”, as the co-founders explained how they sort of fell into their company by initially trying to help out their parents. They then went on to explain the challenges of ensuring that their product could add value for their customers, and the difficulties they faced as they tried to segment markets, and straddle the line between producing hardware and providing software for their customers. 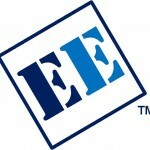 After Dropcam, we visited Equilibirum Capital, a visit that has been highlighted in detail here. 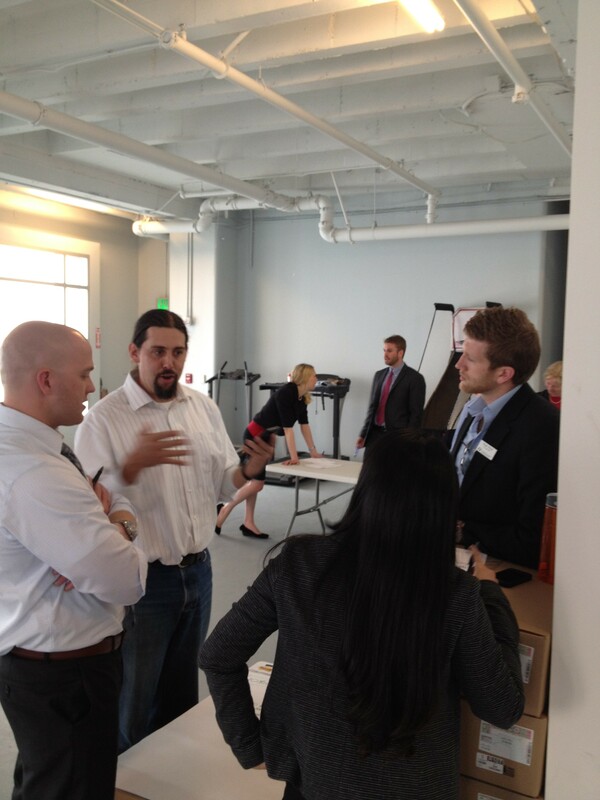 Then we were off to the Capital One Innovation Center for an interactive group exercise with Josh Greenough, another UO alum. Josh focused a great deal on the innovation that is taking place nowadays with the increasing prevalence of mobile technology and transactions. He also discussed the role his team plays at Capital One, which is intriguing because they serve as an incubator inside of a much larger banking entity– two groups with very different levels of risk tolerance. 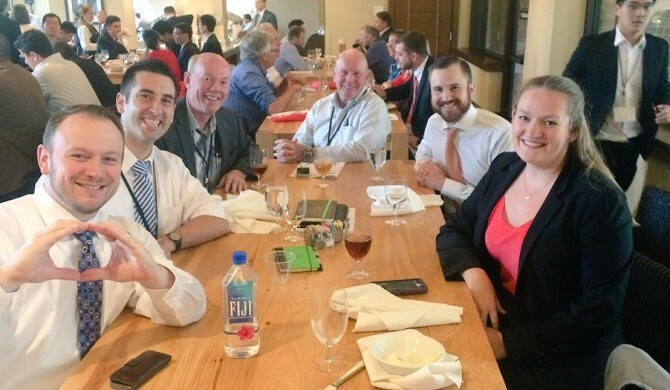 Although our first day was not finished yet (still on the docket was a wonderful dinner at the Century Club), our official business visits were complete. And in spite of the hectic scheduling, I think that everyone felt stimulated by the fast pace and excitement of San Francisco and its rapidly evolving tech environment, and hungry for more (and also that dinner at the Century Club!). The following post was written by Rob Woltil (LCE 2013), regarding the trip he took to Thailand with for the Bangkok Business Challenge, with his Real Energy teammates, Joe Wright (LCE 2013) and KaLynn Alley (Law, 2013). Coming to the University of Oregon to get my MBA, I knew that there would be fun times and extraordinary opportunities awaiting me over the next two years. However, I did not foresee that I would be in Bangkok, delivering a passionate monologue about an investment vehicle that specializes in energy efficiency retrofits to a room that consisted of over 300 Thais and an assortment of business school professors and students that covered over 20 countries and an equal amount of languages. This was the elevator pitch. 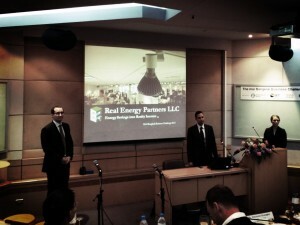 It was the first formal introduction of the teams that would be competing in the Bangkok Business Challenge. Ideas ranged from a French bakery chain to floating solar farms for specific use in the mining industry, which was presented by a team of Australian EMBA’s. 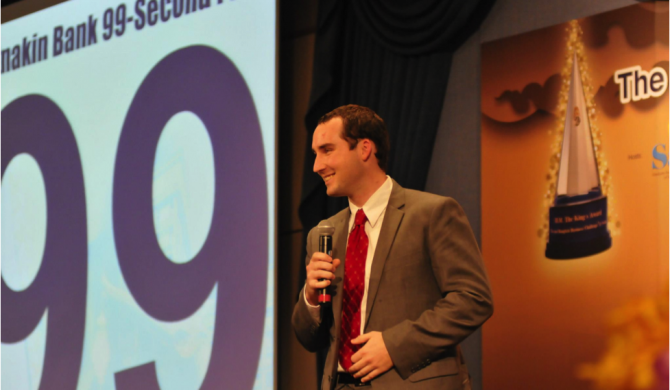 The crowd loved every part of the elevator pitch competition from the seamless banter provided by our two hosts Tony and Troy to the big clock counting from 99 to zero on 16 teams from all over the world. As a Meyers-Briggs identified introvert without an affinity for public speaking, I was content making it through the pitch without freezing or passing out. 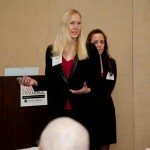 The elevator pitch set the table for the competition as it was fast paced, fun, and competitive. We presented a grand total of three times over the weekend: once as a warm-up round, once for the semi-finals, and once in the wildcard playoff. 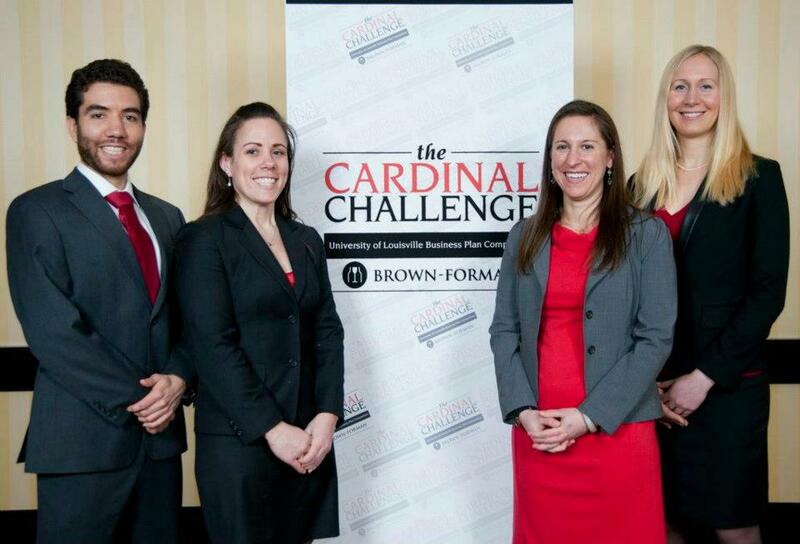 Despite receiving positive feedback on our team and idea, we failed to advance to the finals. This disappointment was quickly quelled by two of our judges giving us contact information to several international investment companies and hedge funds that they believed would be interested in our idea and an opportunity to attend the awards ceremony. And this was no ordinary awards ceremony. 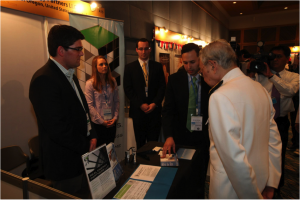 To begin, every team gathered at their venture’s trade show booth, and a representative of the King of Thailand himself came around to every team to get a one minute pitch of what it was that we do. Thankfully, my teammate Joe Wright took the lead and nailed the explanation. The King’s representative walked away nodding his head, I’d like to think it was a nod that said, “Well done Oregon, well done.” The second part of the awards ceremony was held on the Chao Phraya River as part of a river cruise. Prizes were passed out as we dined, danced, and admired the great city of Bangkok with 200 of our newest friends. The Real Energy team received a trade show visit from a representative of the King of Thailand. Words cannot express how amazing this trip was for us. We owe a debt of gratitude to Sasin Graduate Institute of Chulalongkorn University, the Lundquist Center for Entrepreneurship, and our vast Oregon network of people who helped, critiqued, and mentored us through this process. While we missed out on the finals this time, we will be working our tails off to see them in a month at the New Venture Championship in Portland. Until then…GO DUCKS!!! The following post is synopsis of a brief interview with EndorsEase cofounders David Fishel (WSMC 2013) and Lauren Berkema (MAcc) following their trip to Cincinnati for the Spirit of Enterprise Competition. Teammate (and cofounder) Tony Cresta (WSMC 2013) was not available at the time. Last week, two OMBA’s and a MAcc student had the opportunity to travel to the University of Cincinnati to compete in the UC Center for Entrepreneurship Spirit of Enterprise Graduate Business Plan Competition. 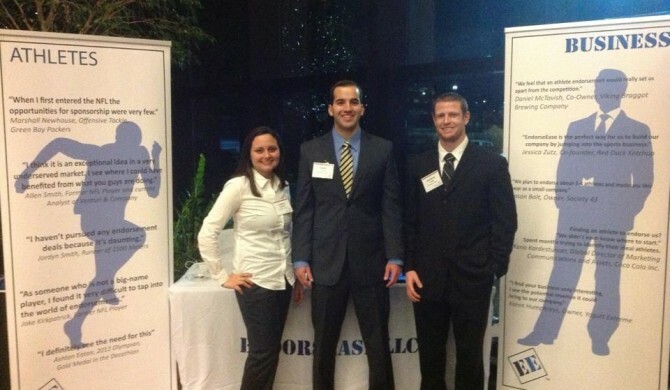 David Fishel, Tony Cresta, and Lauren Berkema had a tough journey to and from Ohio thanks to some winter weather, but ultimately the team arrived on Thursday night eager to present their business, EndorsEase, to the judges at hand. 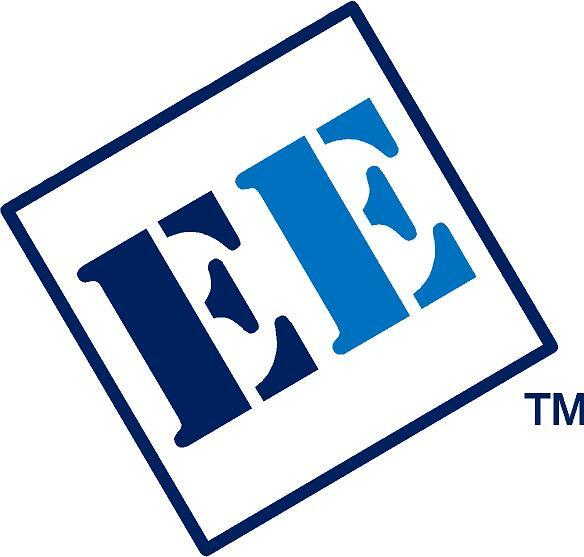 According to the Facebook page, “EndorsEase is the Match.com for underrepresented athletes and businesses to create endorsement opportunities.” In a nutshell, the team wants to help professional athletes and businesses create meaningful and mutually beneficial relationships that may otherwise go unnoticed. What the team learned during their time in Cincinnati was that quantifiable data can be difficult to come by, but are essential to proving yourself to investors. While judges loved the team’s presentation and concept, they wanted more clear evidence to measure business applicability and revenue generation. This unfortunate hangup led EndorsEase to finish 2nd in their group (to the eventual champion of the competition) and miss out on the finals. 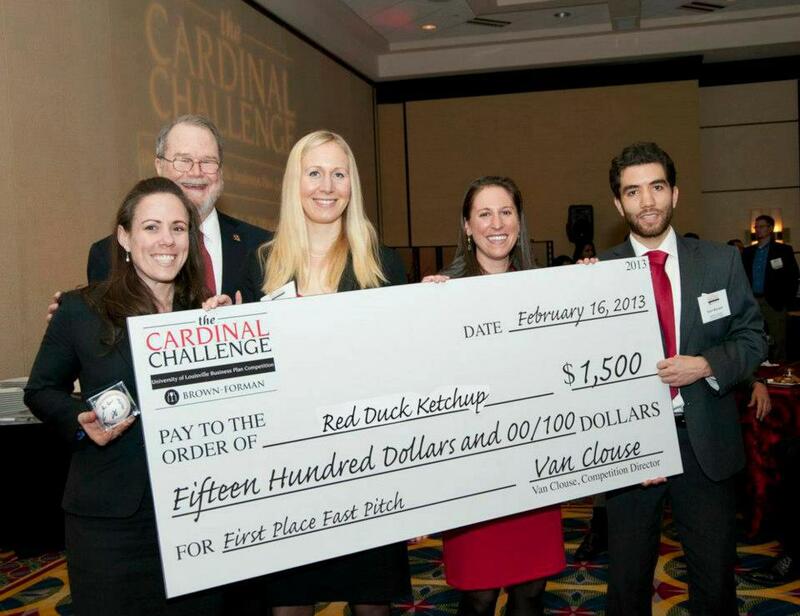 At 5:00am on Friday, February 15, the University of Louisville’s Cardinal Challenge began for Red Duck Ketchup. As we all slugged through the security lines at the Eugene Airport, our excitement was deeply concealed beneath the drowsiness that accompanies wakeup calls before the sun rises. 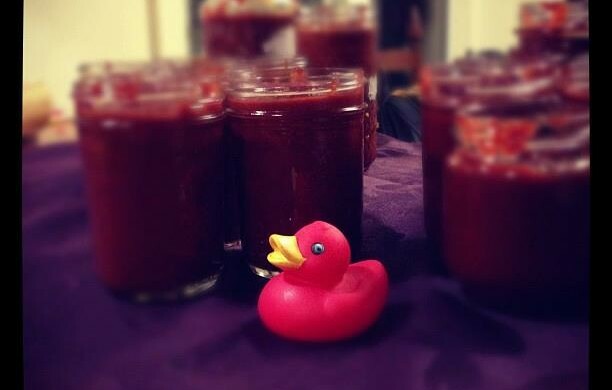 Though we didn’t quite know what the next 48 hours would bring, we confidently napped on the plane knowing that if nothing else, Red Duck Ketchup was coming to Louisville, Kentucky in full force. This was just the calm before the storm. Our arrival in Louisville was much sunnier, colder, and more alert than our departure from Eugene. After briefly hiding Kurt’s luggage from him while we checked into our rooms, we changed, regrouped, and finally walked up to the competition’s opening reception. 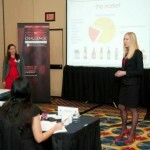 At the reception, each team was to give a 30-second brief on its business. We elected to send Shannon up to tell the crowd just what Red Duck was all about, and were immediately welcomed by a chorus of “Go Ducks!” from people in the room (and Nathan wasn’t even one of them!) Still, it was a nice warm welcome. 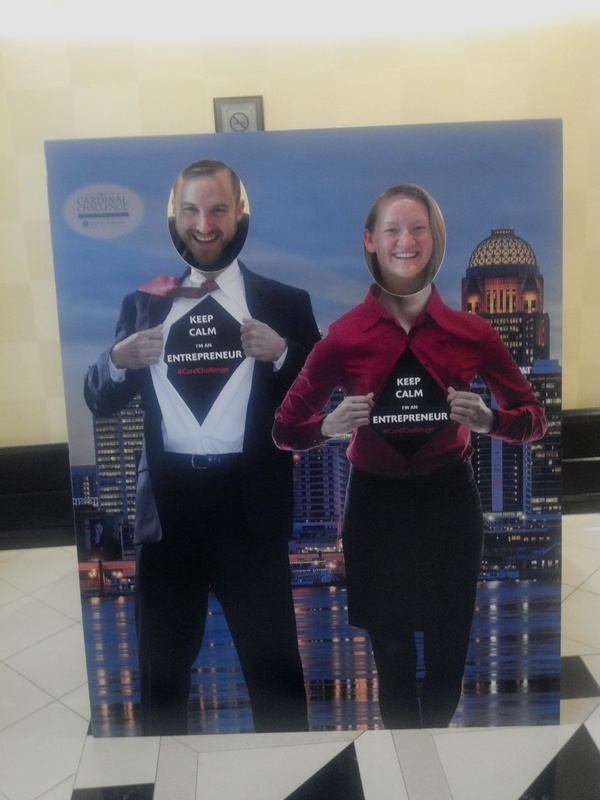 As the evening wore on, it became very clear that we were in Louisville, Kentucky. The Southern drawls, the Woodford bourbon and Yum! Brands hats in our gift bags, and of course, the crown jewel of “Possibility City”: personalized Louisville Slugger bats. It took every ounce of our energy to keep those bats in their boxes when we received them, but we managed to contain our home run swings for at least a few hours. When the reception ended, we all decided to grab some dinner and call it an early night knowing full well that the next morning we’d be putting our game feathers on. 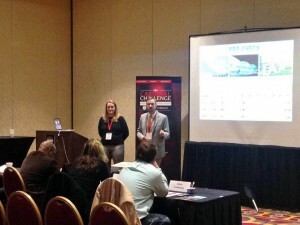 Luckily for us, we were the last team in our 3-team track to present, which meant that we could sleep in. The morning seemed to fly by, however, and after a practice run, we found ourselves passing out ketchup samples to the four judges. The room our track competed in seemed packed. Though our attention was, of course, focused on the four esteemed judges seated immediately in front of us, there was a great energy in the room punctuated every so often by the photographer’s flash bulbs. Our presentation went well- it was perfectly timed, we had great answers to most of the judges’ questions, and even managed to get laughs from the whole room when describing the origins of our company name (We’re all Ducks, and our ketchup is red. Sorry, nothing more glamorous than that). Still, we were on edge throughout lunch as we waited for the winner from each track to be announced. As we nervously nibbled on “Kentucky Pride” chicken (it wasn’t fried!) and Sky High Louisville Pie (cheesecake with pecan pie in the middle- over the top for sure), we especially enjoyed the brief speech given by Louisville Mayor Greg Fischer as he rattled off reasons why we should all move to Louisville. We were struck by his business experience, and especially inspired by his charge to go forth and be good citizens by giving back to the community. Utter disappointment. There was really no other way to describe how we felt when another team’s name was called from our track to advance to the finals. We felt so good about our presentation, we got great feedback from everyone sitting in our room, and yet that day we came up just short. We had no time to feel sorry for ourselves, however, because within the next hour we would receive feedback from the judges and then compete in the Fast Pitch (Elevator Pitch) competition. The feedback we received from the judges quite possibly made the loss worth it. They expressed how difficult their decision was and reassured us that just because we hadn’t advanced didn’t mean we weren’t going to make Red Duck a successful business. After a few pointers, a few handshakes, and a few business cards, we headed over to the Fast Pitch competition. Shannon delivered the fast pitch of the century. We felt good after our presentation, but we felt REALLY good after her pitch. She combined all the elements of what we have learned a successful elevator pitch includes: passion, specifics, an ask, and an alluring investor ROI. Our eventual win wouldn’t be announced for several hours, but we sat back and enjoyed watching the finalists compete for the $25,000 prize. 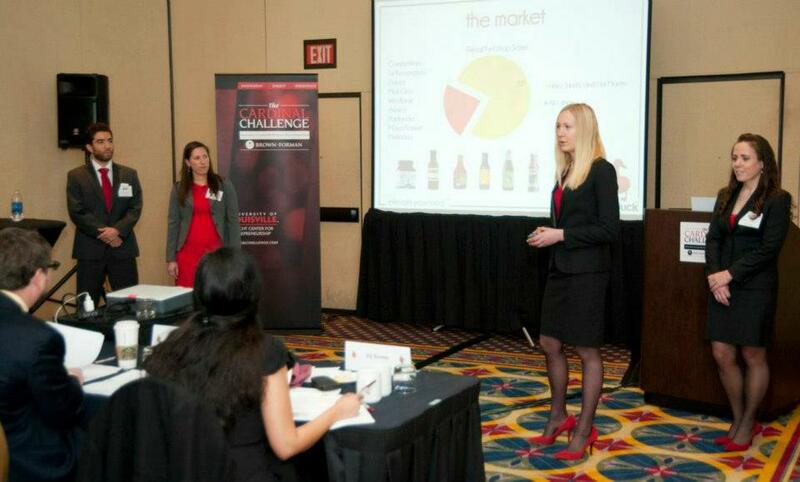 It was fascinating to see other programs present their business plans. These presentations were well-oiled machines, with at times (seemingly) every breath calculated. We would have loved the chance to present just one more time in Louisville, but we’re not convinced that we won’t be back there soon to do so. Next time, in front of executives with a sale on the line. The real victory of the trip came at the closing reception when we were given the chance to sample our ketchup to everyone. 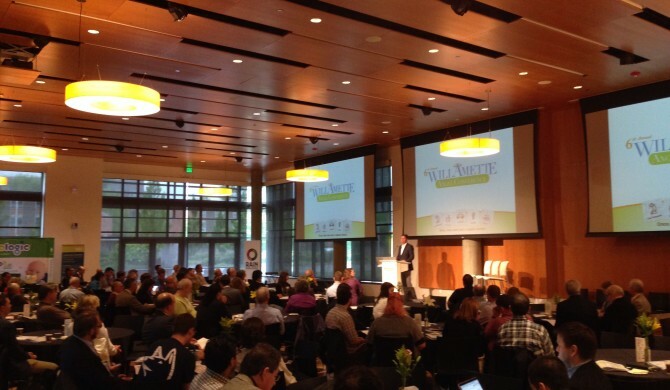 We knew that we had a good product that would do well in the Pacific Northwest, but the overwhelmingly positive sentiments expressed by everyone in the room were all the affirmation we needed to know that this is a concept that will do well nationally. People told us they don’t even like ketchup and they liked ours, they bought the samples we had right out of our hands, and handed us business cards imploring us to contact them because they own supermarkets on the East Coast. 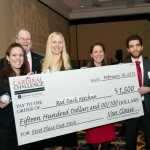 And then, we won $1,500 for our fast pitch grand slam. Red Duck Ketchup receives their prize for winning the Fast Pitch competition. An oversized check, gushing feedback, and a renewed sense of purpose were the wind beneath our wings as we came back to Eugene. Competing at the Cardinal Challenge was an invaluable boost to our confidence that we certainly appreciated as we hit the 4-month mark in our concept’s brief history. But perhaps the more lasting remnants of our time in Louisville will be the connections we made. 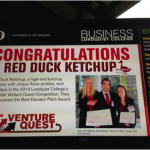 We met dozens of people who loved our ketchup, loved us, and undoubtedly (yet again), have a renewed sense of respect for the caliber of talent coming out of the Oregon MBA program. Maybe it’s something in the water here in Eugene. Or maybe it’s something in the ketchup. 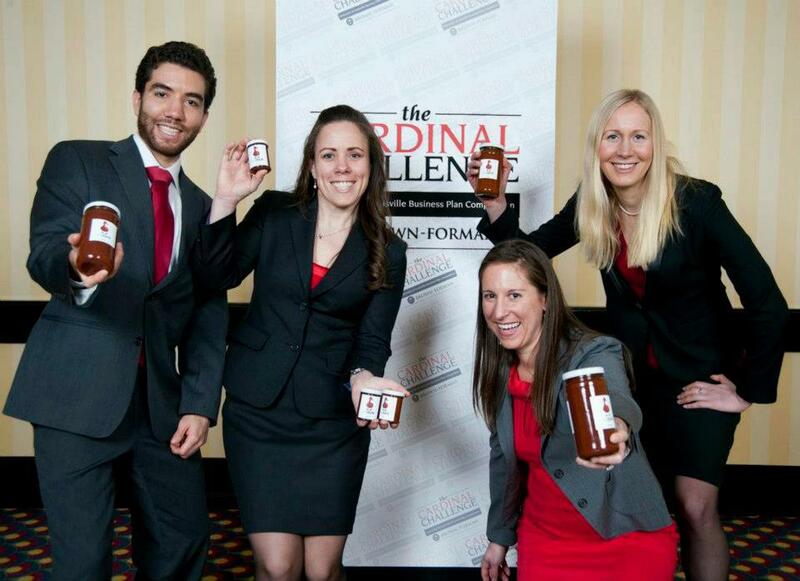 Want to know more about Red Duck Ketchup, the recent champions of the Graduate Venture Quest competition? 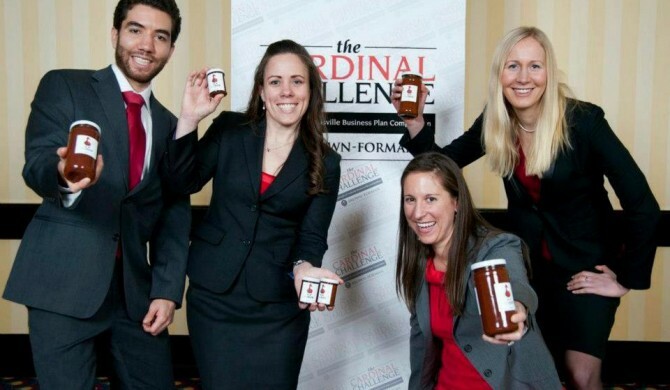 Here is a quick profile of the team, their business plan, and the ketchups’ successes so far! Kurt “More Meatloaf” Barajas (JD/MBA 2013): Financial whiz and negotiation specialist with concentration in business law. Karen “Crazy for Veggie Burgers” Bonner (MBA 2013): Background in finance and corporate strategy, product development specialist, food nerd. Shannon “Pass the Cajun Tots” Oliver (MBA 2013): Experience at food startup companies, operations expert, concentration in sustainability. Jess “Don’t Call Them Freedom Fries” Zutz (JD/MBA 2014): Background in restaurant and kitchen management, branding, marketing, and social media professional. 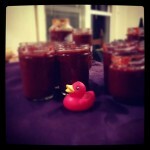 What is Red Duck Ketchup? When was the last time you were excited about ketchup? As adults, we realized that ketchup’s cachet has faded as our palates have matured. We started Red Duck Ketchup as a specialty foods company based to re-introduce the world to ketchup through our line of artisan condiments and our quirky West Coast brand. 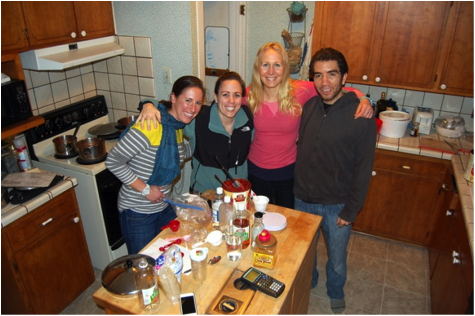 During the Oregon MBA’s Engaging Asia experiential learning trip, the four of us found we shared passions for travel and food. After many conversations lamenting the fact that our grocery stores back home don’t carry many products featuring our favorite exotic flavors, we realized there’s a gap in the market. We decided to remedy this by combining our business backgrounds with our foodie expertise to create a line of artisan ketchups. 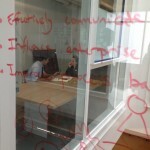 How did we develop the business? 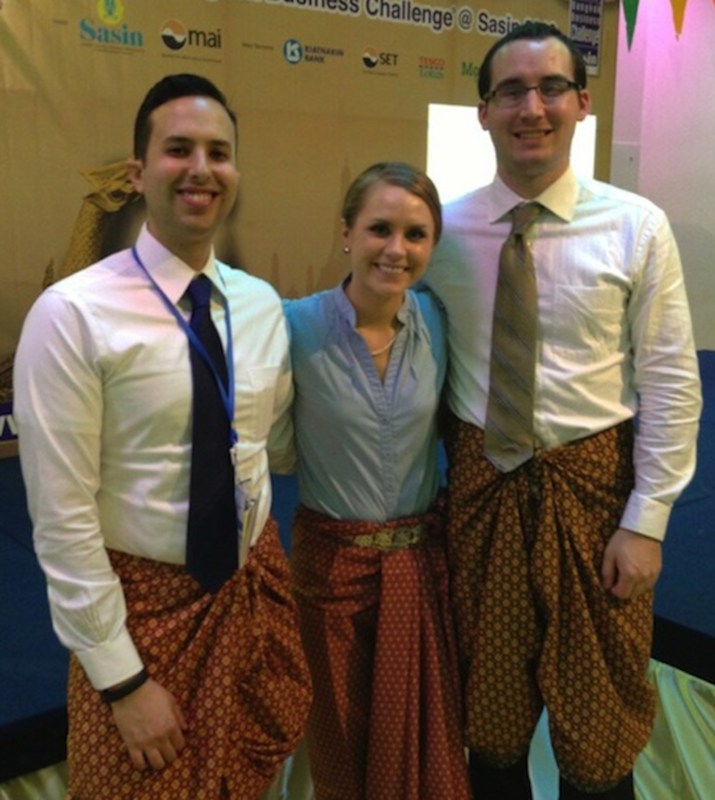 After returning from our trip to Asia in September, the four of us enrolled in New Venture Planning, part of the Lundquist Center for Entrepreneurship’s Venture Launch sequence. This course gave us the opportunity to transform our vision into a solid business plan. We had opportunities to meet with successful entrepreneurs and other mentors to guide us and help us prepare a defensible business strategy. 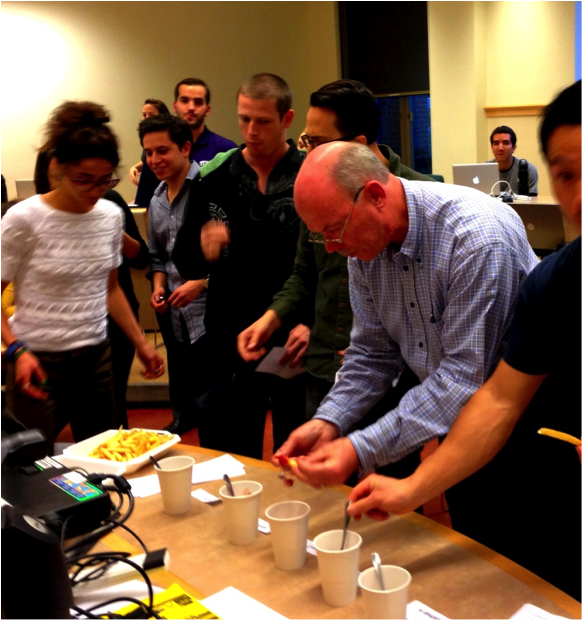 During the course of the term, we fine-tuned our recipes and did blind taste tests against other specialty ketchups. 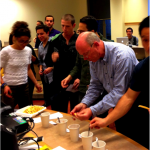 Our biggest tasting event happened at the beloved Bagel Day, a weekly LCB event that supplies grad students with snacks and coffee. We were able to bring in fresh French fries and conduct a head-to-head blind taste test of our three ketchups (Classic, Spicy, and Curry) against three similar competitors. After 52 people completed our market research survey, we crunched the numbers and were pleased to see that Red Duck Ketchup crushed all three competitors! This was a pivotal moment in the term, as it provided us with some basic customer validation and a compelling chart for our business plan. We then had the opportunity to participate in the OMBA’s Venture Quest Competition, where we won the elevator pitch and business plan competition, securing almost $2000 to start funding our business. 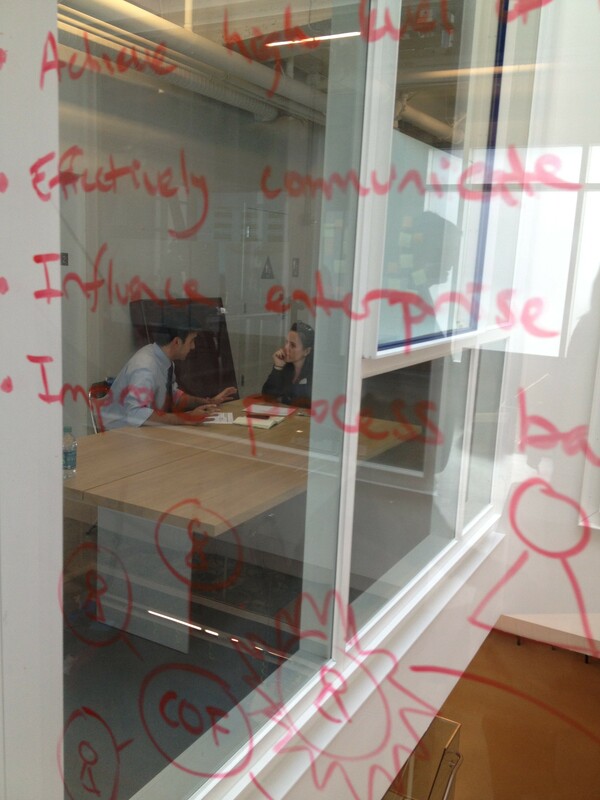 Over winter break, we worked to refine our business plan and begin positioning our company for success in the future. With the start of winter term now here, we’ll be moving on to Venture Startup 1, the next phase in the venture launch sequence. Quack!